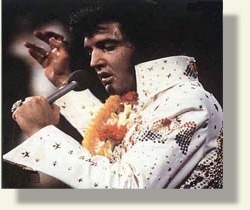 HAWAII THEMED EVENTS - Elvis, Elvis…Oh, Elvis! Our 1950’s Movie Theater entrance sets the tone, complete with our custom “Group Name” insert. Guests enter the past as they bop on over to “Gertrude’s Beauty Salon” and get their hair greased up for the night or maybe even a tattoo! Up on the bandstand, which is decorated with giant glittered 45 RPM records, white feathered palm trees and “Elvis” images, the Wolfman howls with lots of platter chatter and gets the gang going with “Hula Hoop”, “Twist” and “Limbo” contests. And now, here’s the King himself…well actually four (yes four) “Kings”…a normal “Elvis” guy, plus a Chinese Elvis, a Black Elvis and a Female Elvis…all on stage “Live” to keep the party rockin’ while our guests enter the “Elvis Station” and prepare for the Elvis Karaoke Competiton, hosted by “Tina Turner” and “Stevie Wonder”.